I'm a prolific composer and songwriter. Here is a selection of recent works. My current project is a collection of duets based on Welsh folk tunes. These will form a flexible collection to introduce more of the lesser known Welsh dance tunes to a wider audience. A short show written for and performed by Glasallt Therapeutic community in March 2012. An Arts Council and Big Lottery-funded sea shanty writing project, working with primary school children in Pembrokeshire, to create, perform, and record contemporary work and sea songs inspired by coastal life in the 21st century. Fiddlebox's second album has a strong Klezmer flavour, and is co-written by myself and George Whitfield. Click here to buy. Fiddlebox's eponymous first album features tunes and songs written by myself, as well as by George Whitfield and traditional tunes arranged by us both. Click here to buy. A commissioned work, funded by the Arts Council of Wales. 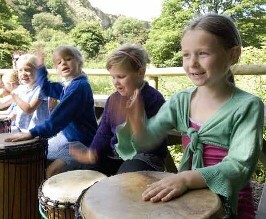 It is a show performed by children, supported by 2 or 3 professional musicians. 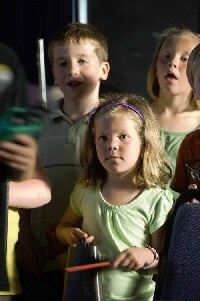 The children are very much involved in the final outcome of the show. The inspiration for Totem is the idea of meeting and communicating with spirit animals. This concept appears in many nature based and shamanic religions. This idea lends itself to creative work with children, who naturally take on different identities in play. Other important influences were stories from the Welsh collection, the Mabinogion, and the legend of the shape-shifting magician Taliesin (also known as Merlin). It is written for singers, narrators, percussion and early instruments, such as sheep and deer bone flutes, gue and concouka, as well as bass and fiddle. In a simple narrative, participants are led to a cave at the top of a remote mountain, in which they undergo a transformative ritual. Totem was first performed in Cilycwm primary school, and has also been performed by a group of adults with learning disabilities in Llandovery and several other venues, including with a group of over 100 children in Pembrokeshire. A commissioned suite for chamber orchestra written for and performed by the Cleddau Music Makers in 2008 and again in 2010 as part of the Rite of Passage art and heritage project based in Pembrokeshire. It uses both Welsh and Irish folk music and is about the links between West Wales and East Ireland in the 19th century. A semi-dramatic show, written for a five-piece Celtic band, percussion orchestra and narrator. It is a love story set against the conflict between the old country folk of the Welsh hills, and the pioneers of the textile industry in the mid-nineteenth century. The beauty of the hills to which the industrial revolution came is lovingly evoked in this piece, as well as the dynamism and energy of the mechanised spinning and weaving equipment. The interplay of the two, forms the dramatic tension between the main protagonists, Megan, the girl from the country, and Morus, the mill-owner's son. This show was premiered at the national Wool Museum of Wales. Other performances have included the Small Nations Festival, Pontardawe Festival, and Solva Woollen Mills. A semi-dramatic piece for 20 instrumentalists and singers including violins, percussion, bass, keyboard clog dancer and Welsh pipes. It was inspired by a passage by the 8th century monk, the Venerable Bede, in which he likens the span of human life to the flight of a sparrow across a banqueting hall during a mid-winter feast. The piece operates on four timelines: the brief flight of the bird itself, the evening of feasting and celebration, a human lifespan and the historical period between the 7th and 8th centuries in which Christianity was introduced to the early Celts. It is thus about the shortness of life and the importance of dancing in the moment. Gwyl Nos means both 'Night Festival' in Welsh and also has a pagan meaning, which is a midwinter celebration of the dead and can be loosely translated as 'Day of Lamentations'. It was first performed in Llandeilo in 2007, and has been performed 5 times since. As a spectacular show it is suitable for festivals, mediaeval pageants and story-telling based events.